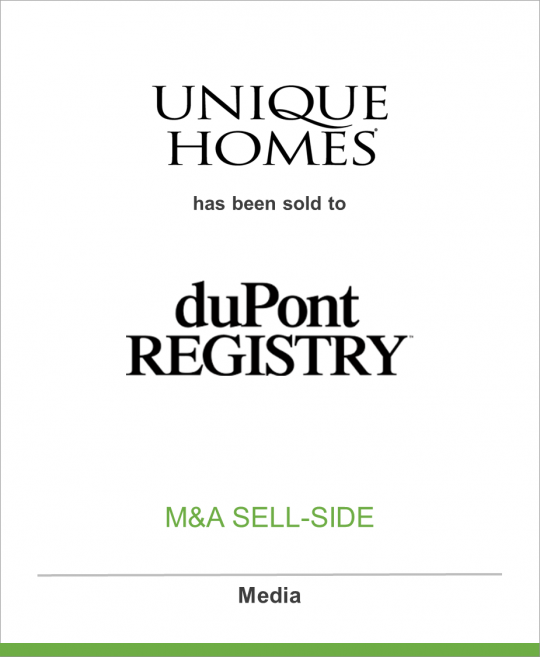 DeSilva+Phillips client, Network Communications Inc., has sold Unique Homes to duPont REGISTRY. duPont REGISTRY™ and Unique Homes, two separate powerhouses within the luxury real estate industry, have entered into a partnership to further benefit and accommodate luxury realtors and brokers seeking innovative marketing solutions. While Unique Homes and duPont REGISTRY™ will continue to be run as separate brands, the combined resources will only increase the potential for each. Among the duPont REGISTRY™ line of high-end publications are A Buyer’s Gallery of Fine Automobiles, A Buyer’s Gallery of Fine Boats and A Buyer’s Gallery of Fine Homes. Unique Homes, the Princeton, New Jersey, luxury real estate media brand about to celebrate its 44th year, also has an impressive list of publications, including Unique Homes, Ultimate Homes, Unique Homes China Edition and The High End, among others. The merger will create a pooling of resources unlike anything the real estate industry has ever seen. From a long list of titles, to countless points and methods of distribution, to massive digital audiences, agents and brokers involved within these marketing platforms will have direct access to a larger and more affluent audience. Founded in 1984 and headquartered in St. Petersburg, Florida, duPont REGISTRY™ produces the leading luxury marketplace publications for automobiles, homes, boats and watches, as well as the yearly Exotic Car Buyers Guide. For more information, visit the duPont REGISTRY™ website at www.dupontregistry.com.